The proximity to the beach and village make a rental car unnecessary, plus there are other beaches, some remote, worth discovering. The nearest is La Playa de Los Muertos (beach of the dead), so named because it's reached by walking through the village cemetery (which is worth a bit of a look). To get there follow the beach south of the village until the road ends. Take the trail/road to the left that goes over the hill and through the cemetery to the beach beyond. This beach has good snorkeling on calm days and a great place for kids to swim if the surf is up on the main beach. There is a roped off area for swimming and no fishing boats launch or disembark here. It is but a 2 block walk into town as well. Please use the form to get in touch with any questions and to request a reservation. Amazing view! We loved this casita! Everything about our stay was absolutely perfect. The casita is spacious and comfortable, and was very well stocked with everything we needed. You can see the ocean from every room...there is even a little window in shower! The bed was super comfy, as were the chairs on the patio. The housekeepers came everyday. They were so friendly and helpful when we needed something. The beach chairs, umbrellas and boogie boards were a real treat, we used them everyday. The location could not be better - just a few minutes to the beach and town. While close, the walk back is a mini workout - there are a lot of steep stairs to climb. I would absolutely stay here again! Nothing but ocean views from every room! Loved this spot. Ocean from every window, surf boards, umbrellas and chairs to use, fully equipped kitchen. Can’t wait to return. 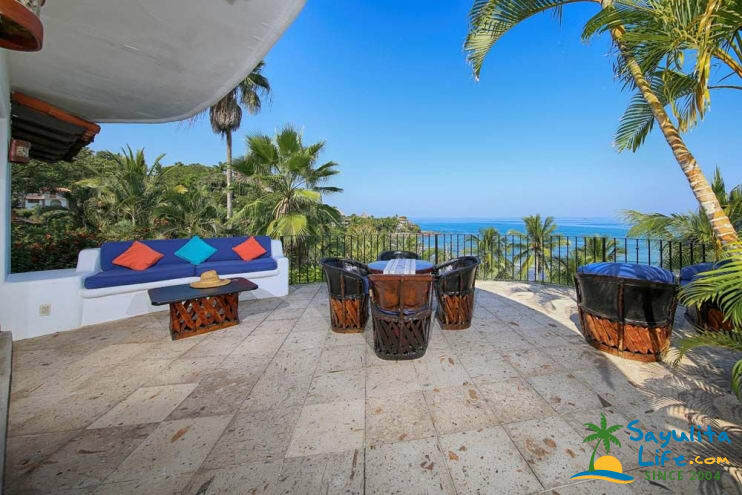 This one bedroom apartment provides a true Mexico experience is a garden setting on the hillside above the beach. Within an easy walk to town and the beach. They provide beach chairs, etc. so all you need to pack are clothes. The large terrace is the perfect place to sit day or night. We saw whales right off the shore one morning while laying in bed. Ann was great. Very communicative and prompt on her replies to my questions. The place is great with incredible views. I would stay here again in a heartbeat. It can be warm during the summer months, but Ann was great in getting me some extra fans to make the place even more comfortable. 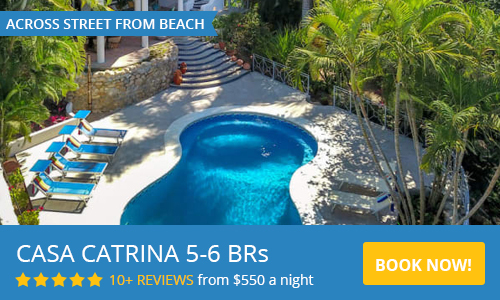 (I was there in June and it was exceptionally hot, normally this would not be an issue with the ocean breezes and open layout) I have stayed in many houses in Sayulita and this seemed to be one of the best values too for the money. Very comfortable and stylish with fantastic views over the bay from every window. We felt at home immediately and would love to come back one day. Ann was very helpful and easy to communicate with when booking. This lovely casita was just the right size for my wife and me. Of course, we spent most of our time out on the patio where we had a gorgeous view of the western part of the bay watching the surfers, paddle boarders, swimmers, fishermen and tour boats. Case Carlitos is located about 1/4 mile away from the heart of the beach action and it was actually nice not to have that high activity directly in our view. If we wanted, we could see it from the edge of the deck. It was good to be away from the immediate noise of the main beach scene although the constant sound of surf usually muffled things nicely. Being able to be in a quiet setting on our deck and then after a 5 minute walk be in the centre of all the action in downtown Sayulita was a nice convenience. We were surprised how touristy the town had become since our last visit some 5 years ago. There can be quite a buzz of energy in the evenings and weekends. We liked it but those looking for a quiet little get-away town might think otherwise. For the physically challenged, Casa Carlitos was 82 steps up if approached from the bottom or about 50 steps down from the top. We're in our early 70's and found it fine if we took it slow. If that is not a concern for you, we recommend these accommodations. We enjoyed a wonderful week perched overlooking the beach, viewing the pilot birds floating in the sky, the pelicans dive bombing for food, the surfers tumbling in the huge waves and the truck pushing and pulling the fish boats on and off the beach...fabulous view and wonderful exercise climbing up and down the stairs to the beach. We enjoyed eating at many of the restaurants and long hikes along the beach. We have been to Sayulita many times and each time our experience has been nothing short of excellent. It is a beautiful little bay with many excellent restaurants and shops. While visiting Sayulita, Casa Carlitos is our home away from home. We would not change a thing and will be back again. For your security, we accept PayPal and also personal checks. Please contact us for details. Rates are in US Dollars. Note: All rentals are Saturday to Saturday during the "High Season which is Nov 1st through May 14th". Off-season rentals are flexible with a three day minimum and rates reduced by 30%.. Seasonal Rates for Casa Carlitos - Rates include taxes and daily maid service. All reservations require a deposit of 50% in order to hold the reservation. The balance of the rental charge is due one month prior to your arrival. If you have any questions, please discuss this with the contact for the house you are renting. If you cancel a reservation and we can re-book the house, we are happy to refund your deposit. If, however, we cannot re-rent the house, we will not refund the deposit. Ann Sparling White is one of 4 siblings who inherited the Sayulita houses, Carlos and Carlitos from their parents, Charlie and Vicenta Sparling. The senior Sparlings bought the property and built the original house in the early 1970s. The family has enjoyed seeing a small fishing village become a diverse and beautiful tourist destination, and now are thrilled to offer our homes for others to enjoy. The house was renovated in the early 2000s and the casita, Carlitos, was built at that time. Ann is a retired mental health counselor who now lives near Nashville, Tennessee so she can be close to her children and grandchildren.